Xiaomi has launched it’s new smartphone the Mi A1 smartphone in the Indian market today as was expected. We yesterday shared that the new Dual camera phone will be called as Xiaomi Mi A1. The event started with the Indian CEO sharing some of the key insights of the Xiaomi’s progress in India and Globally. He then handed over the product launch to Donovan Sung. Donovan Sung introduced the new Xiaomi Mi A1 smartphone which is made of aluminum and comes with a curved design. It is the same smartphone – Xiaomi Mi 5X which was launched in China couple of Weeks back. Design and Display – The metallic smartphone will come in 3 different colors – Black, Gold and Rose Gold in India. The Xiaomi Mi A1 comes with large 5.5 Inch Full HD display with Corning Glass coating. Also, the mobile is very light and thin measures 7.3 mm and weighs 163 grams. The smartphone comes with a new graphite sheet which helps to keep the smartphone cooler by upto 2 degrees. 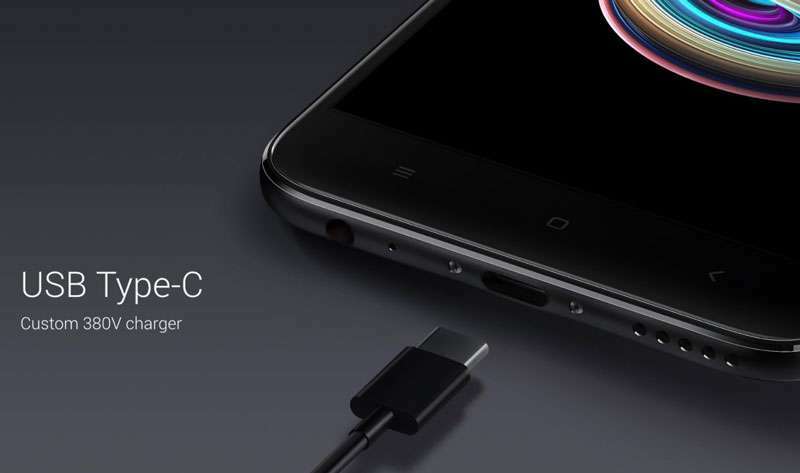 The smartphone comes with the USB Type C port. There is a circular fingerprint scanner at the back of the device. The smartphone looks more curved compared to the Xiaomi Redmi Note 4 and will be easy to handle and use. – The metallic design is fingerprint resistant, and you will not get fingerprint marks on the back of the phone. The Xiaomi Mi A1 comes with the Flagship Dual Camera (Xiaomi calls it a picture perfect camera). The camera comes with a telephoto lens and a wide-angle lens. The smartphone comes with two 12 Megapixel lens, and the telephoto lens comes with f/2.6 aperture lens and the wide angle 12 MP lens has a f/2.2 aperture. The smartphone camera can click images with the focus on the subject and blur the background. Donovan Sung also compared the camera clicks from Xiaomi Mi A1 vs. the OnePlus 5 and the iPhone 7 Plus. Although, he said that the images from the Mi A1 look better compared to the iPhone 7 plus, but we think there is more softening and software processing happening on the photos on the Mi A1. Besides, the Mi A1 images look very good. Further, the Mi A1 also comes with natural color correction as well as beautify functions which we have seen in the images above. The Xiaomi Mi 1A comes with a 2X Optical ZOom and upto 10X digital Zoom. We will have to do more testing on the Xiaomi Mi A1 camera to conclude how good is the camera on the device. The Xiaomi Mi A1 is powered by the Qualcomm Snapdragon 625 processor clocked at 2.0 GHz and comes with the Adreno 506 GPU. It is a bit disappointing that Xiaomi has not upgraded the processor to the latest Qualcomm Snapdragon 630. Music – Xiaomi Mi A1 comes with a 10V Smartphone AMP and comes with DHS audio calibration algorithm to ensure more immersive sound. Supports standalone audio amplifier and offer great audio listening experience. IR Blaster – The smartphone also has the Infra-red sensor to control TV sets or ACs. Battery Capacity – The smartphone comes with 3080 mAH capacity battery, though Xiaomi has not shared if it has any fast charging support. The Xiaomi Mi A1 is the first Xiaomi smartphone which comes with the stock Android experience, and this is the first time Xiaomi has worked closely with Google to bring the Android One experience to the Xiaomi phone. Android One was the Google’s initiative which they started back in 2014 with Android One smartphones, but it lost steam over the time. Xiaomi and Google have today revived the program with the Xiaomi Mi A1. The Xiaomi Mi A1 will also get the faster updates. Also, it can get the Android Oreo 8.0 early compared to the other Xiaomi Smartphones. The smartphone will get a confirmed Oreo update by the end of the year and will also get the Android P as well. The smartphone will run fluidly with the Android One Software. The smartphone will be available to purchase from Flipkart and comes with 4 GB of Ram and 64 GB storage and is priced at Rs. 14,999 in India. The smartphone will go on sale on 12th September noon on Flipkart and Mi.com. More Insights from Xiaomi Head Manu Kumar Jain. He said that the focus of the company is to bring innovative products like the Xiaomi Mi Mix and also he shared about the Xiaomi’s Surge S1 processor which they have developed in-house. Xiaomi is the number 2 brand in the Indian market with around 17% market share. Furthermore, Samsung is the number 1 brand with 24% market share, but Xiaomi is growing faster and may topple Samsung. Additionally, Xiaomi has also started expanding operations in the retail market to help them gain share and close the gap on Samsung. Even, the company has started 100 MI Home stores in the country to ensure better customer service. Notably, Xiaomi was launched 3 years back, and till date, they have sold over 25 million smartphones in the Indian Market. It is a phenomenal success for the brand. Xiaomi has also launched the Mi Mix 2 smartphone in India. Lenovo K8 Note or the Xiaomi Mi A1- Which smartphone is a better Choice? Lenovo has launched the K8 Note smartphone in India very recently for Rs. 12,999 and Rs. 13,999. The highlight of the K8 Note is the dual camera setup, stock Android, and the price tag. With the increasing craze for stock Android in India, Xiaomi joined the space with the Xiaomi Mi A1 smartphone as a part of Android One program. The Mi A1 is priced at Rs. 14,999. If you’re unable to choose between Lenovo K8 Note and Xiaomi Mi A1 between the dual camera setup and stock Android smartphone, then continue reading to know more. Let’s Check out the differences between the Xiaomi Mi A1 Vs Lenovo K8 Note. The Lenovo K8 Note and Xiaomi Mi A1 both come with metal bodies and look great for the asking price. The only difference is the weight and thickness, in which the Mi A1 wins. The K8 Note has a big battery thus weighs at 180grams and 8mm in thickness. The Mi A1 has a smaller battery which makes it just 165 grams and 7.3 mm thickness. The differences can be seen at the back of the phones as the K8 Note has vertically positioned dual cameras, whereas the Mi A1 has horizontally positioned dual cameras. The Mi A1 looks better than the K8 Note in the design aspect. The fingerprint sensor is also present at the back side of the phone on both phones. Both the K8 Note and Mi A1 features a 5.5-inch Full HD display with a 2.5D curved glass on top. The Mi A1 has a pixel density of 403 PPI, and the K8 Note comes with 401 PPI. Both the displays are protected by Corning Gorilla Glass technology. This segment belongs to the Lenovo K8 Note because it has a much powerful MediaTek Helio X23 chipset, which is a deca-core and flagship chip from MediaTek. The chipset is clubbed with 4GB RAM and 32Gb/64GB internal storage. The Mi A1 runs the more popular Snapdragon 625 chipset with 4GB RAM and 64GB onboard storage. Storage in both the phones is expandable up to 128GB with a microSD card. The Mi A1 is a winner here because it rocks flagship dual camera setup. The smartphone comes with two 12 Megapixel lens and the telephoto lens comes with f/2.6 aperture lens and the wide angle 12 MP lens has a f/2.2 aperture. The telephoto lens on the Mi A1 comes with a 2X Optical Zoom and upto 10X digital Zoom. On the flip side, the K8 Note also comes with Dual Rear Camera setup and has a 13 MP Pure Cel Plus sensor at the back, along with a 5 MP secondary sensor. So, the Mi A1 wins the race, going by specs. Both the cameras are decent and in practical scenario offer close performance. Sadly, the Mi A1 has just a 5MP selfie camera but the K8 Note has a powerful 13MP selfie camera. The Lenovo K8 Note and Xiaomi Mi A1 both run Android 7.1 Nougat out of the box. The Mi A1 is confirmed to receive Android O and Android P updates, but there’s no such confirmation from Lenovo about the K8 Note. Battery segment goes to the K8 Note because it has a large 4000 mAh battery compared to the MI A1’s 3080mAh battery. Both the smartphones feature fast charging support. Clearly, both the K8 Note and Mi A1 offer decent specs for mid-range prices. But the Mi A1 is ahead in the camera and design aspect. The K8 Note has the edge on the powerful processor and big battery. So, you can go with either the K8 Note or Mi A1 depending on your usage. For camera- Mi A1. For battery life- K8 Note all the way. I would buy the Mi A1 for the camera and the portrait shots which are simply incredible in this price range. Previous articleSamsung Galaxy Note 8 Vs LG V30: Which Flagship Phone Is Better?